Noémi and Michael Neidorff. Photo by Diane Anderson. Each January, the Arts and Education Council presents the St. Louis Arts Awards where we gather to celebrate the individuals and organizations whose contributions to our artistic community make the bi-state region more vibrant. Proceeds from the St. Louis Arts Awards help A&E invest in the people and organizations that create diverse performances, exhibitions, workshops, art education programs and so much more for 1.6 million adults and children in our community each year. 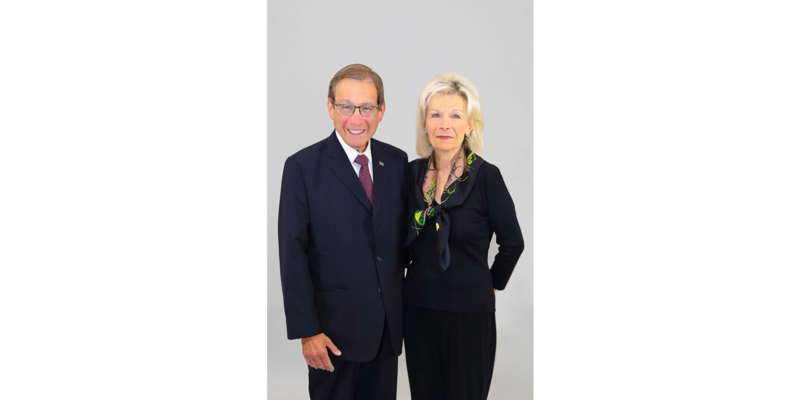 At the 2019 St. Louis Arts Awards, we’ll celebrate seven honorees, including Noémi and Michael Neidorff for Excellence in Philanthropy, who encourage our kids to be more creative thinkers, build bridges among cultures, energize our communities, foster our economy and enrich lives. With so many organizations and causes to choose from, Noémi and Michael Neidorff are intentional about where they devote their time and resources. “We love to be involved and to work. It’s about causes we deeply care about,” shared Noémi Neidorff. Fortunately for the St. Louis arts community, music is one of her greatest passions. Noémi Neidorff was first introduced to the arts by her parents as a young child in Budapest, Hungary. “Their idea of a night out was going to the opera,” she remembered. When they heard four-year-old Noémi playing classical music by ear on the piano, her parents realized she had an innate talent and enrolled her in lessons at the Liszt Academy of Music. Music helped her assimilate to Plainfield, New Jersey after her family fled Budapest during the 1956 Revolution and eventually led her to the esteemed Manhattan School of Music, where she earned bachelor’s and master’s degrees. For the last three decades, her personal passion for music and nurturing young talent has fueled the couple’s philanthropy at numerous arts organizations, including the Arts and Education Council, the St. Louis Symphony Orchestra, where she is vice-chairman and he is a past board chair, Radio Arts Foundation-Saint Louis and Opera Theatre of Saint Louis, where she is board chairman. Nationally, Noémi Neidorff serves as secretary of the executive committee of the Board of the Manhattan School of Music and Michael Neidorff serves as board chairman of the National Urban League and treasurer on the Board of Trustees of the John F. Kennedy Center for the Performing Arts in Washington, D.C.
“It’s important to support the arts, among many other things, because the arts transcend all socio-economic levels,” Michael Neidorff explained. As chairman and CEO of Centene Corporation, one of the top 100 Fastest Growing Companies in the nation according to Forbes, he also says the arts are key to attracting and retaining employees. “They want to know there’s an art museum, a history museum, an orchestra, an opera theater, a zoo, all the things that create a community. And the arts are just one element of creating the whole,” Michael Neidorff added. He also recognizes how important it is to ensure our arts and cultural institutions are thriving for years to come. “Every generation is judged by the value it places on the arts and I think it’s important that we continue to demonstrate that,” Michael Neidorff noted. Tickets for the 2019 St. Louis Arts Awards start at $300 and are on sale through Saturday, January 19 at 6:00 p.m. Learn more about the event here.